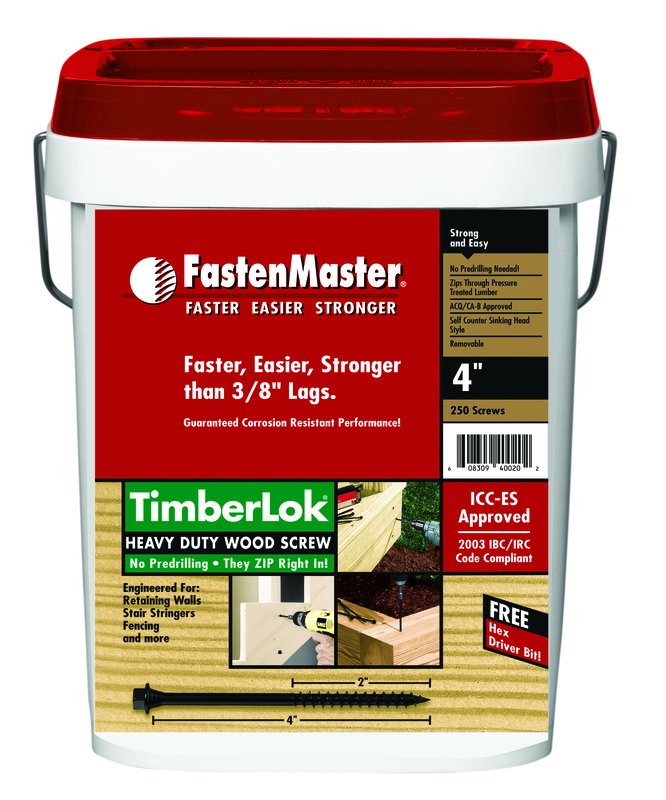 The FastenMaster® Timberlok® enables you to complete wood to wood projects faster, easier and stronger than using a traditional 3/8” lag screw assembly. No predrilling is needed, even with large pressure treated beams, the Timberlok® zips right in. The self-countersinking head design allows for easy sinking and removing. A much stronger design shear value than ordinary 3/8” lags. Perfect for ACQ treated lumber. Timberlok® is also fully compatible with ICC-IBC code. Ideal for decking, fencing, post and beam connections, retaining walls, garden walls, interior cabinets and many other types of wood construction. Sizes range from 2 1/2” to 10”. Sold in 250 pc. buckets. 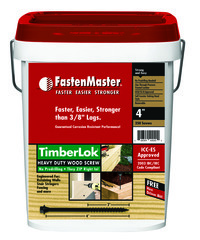 Call your Colony representative for other specialty fasteners available from FastenMaster®, including GuardDog™ ACQ deck screws, RuffNex™ concrete screws, GutterScrew™gutter screws, LedgerLok™ ledger board fasteners and Trusslok™ engineered wood fasteners.